An arcade cabinet, also known as an arcade/coin-op machine, is the housing within which an arcade game's electronic hardware resides. Most cabinets designed since the mid-1980s conform to the Japanese Amusement Machine Manufacturers Association (JAMMA) wiring standard. Some include additional connectors for features not included in the standard. An output, on which the game is displayed. They may display either raster or vector graphics, raster being most common. Standard resolution is between 262.5 and 315 vertical lines, depending on the refresh rate (usually between 50 and 60 Hz). Slower refresh rates allow for better vertical resolution. Monitors may be oriented horizontally or vertically, depending on the game. Some games use more than one monitor. Some newer cabinets have monitors that can display high-definition video. Printed circuit boards (PCB) or arcade system boards, the actual hardware upon which the game runs. Hidden within the cabinet. Some systems, such as the SNK Neo-Geo MVS, use a main board with game carts. Some main boards may hold multiple game carts as well. A power supply to provide DC power to the arcade system boards and low voltage lighting for the coin slots and lighted buttons. A marquee, a sign above the monitor displaying the game's title. They are often brightly colored and backlit. A bezel, which is the border around the monitor. It may contain instructions or artwork. A control panel, a level surface near the monitor, upon which the game's controls are arranged. Control panels sometimes have playing instructions. Players often pile their coins or tokens on the control panels of upright and cocktail cabinets. Coin slots, coin returns and the coin box, which allow for the exchange of money or tokens. They are usually below the control panel. Very often, translucent red plastic buttons are placed in between the coin return and the coin slot. When they are pressed, a coin or token that has become jammed in the coin mechanism is returned to the player. See coin acceptor. Early coin slots could be defeated using a piezo-electric gas fire or gas oven igniter held against the steel bodywork of the cabinet, thus enabling free credits to be obtained. In some arcades, the coin slot is replaced with a card reader that reads data from a game card bought from the arcade operator. The sides of the arcade cabinet are usually decorated with brightly coloured stickers or paint, representing the gameplay of their particular game. 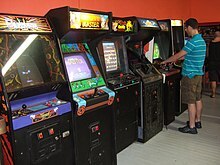 There are many types of arcade cabinets, some in fact being custom-made for a particular game; however, the most common are the upright, the cocktail or table, and the sit-down. Upright cabinets are by far the most common in North America. They are usually made of wood and metal, about six feet or two meters tall, with the control panel set perpendicular to the monitor at slightly above waist level. The monitor is housed inside the cabinet, at approximately eye level. The marquee is above it, and often overhangs it. Controls are most commonly a joystick for as many players as the game allows, plus action buttons and "player" buttons which serve the same purpose as the start button on console gamepads. Trackballs are sometimes used instead of joysticks, especially in games from the early 1980s. Spinners (knobs for turning, also called "paddle controls") are used to control game elements that move strictly horizontally or vertically, such as the paddles in Arkanoid and Pong. Games such as Robotron: 2084, Smash TV and Battlezone use double joysticks instead of action buttons. Some versions of the original Street Fighter had pressure-sensitive rubber pads instead of buttons. If an upright is housing a driving game, it may have a steering wheel and throttle pedal instead of a joystick and buttons. If the upright is housing a shooting game, it may have light guns attached to the front of the machine, via durable cables. Some arcade machines had the monitor placed at the bottom of the cabinet with a mirror mounted at around 45 degrees above the screen facing the player. This was done to save space, a large CRT monitor would otherwise poke out the back of the cabinet, and possibly to avoid eye strain from looking directly up-close at the monitor. To correct for the mirrored image, some games had an option to flip the video output using a dip switch setting. Other genres of game such as Guitar Freaks feature controllers resembling musical instruments. Upright cabinet shape designs varies from the simplest symmetric perpendicular boxes as with Star Trek to complicated asymmetric forms. Games are typically for one or two players; however, games such as Gauntlet feature as many as four sets of controls. A cocktail cabinet. This style is sometimes referred to as Japanese or Aussie style. Cocktail cabinets are shaped like low, rectangular tables, with the controls usually set at either of the broad ends, or, though not as common, at the narrow ends, and the monitor inside the table, the screen facing upward. Two-player games housed in cocktails were usually alternant, each player taking turns. The monitor reverses its orientation (game software controlled) for each player, so that everything seems right-side-up from each perspective. This requires special programming of the cocktail versions of the game (usually set by dip switches). The monitor's orientation is usually in player two's favour only in two-player games when it's player two's turn, and in player one's favour all other times. Simultaneous, 4 player games that are built as a cocktail include Warlords, and others. Cocktail cabinet versions were usually released alongside the upright version of the same game. They were relatively common in the 1980s, especially during the Golden Age of Arcade Games, but have since lost popularity. Their main advantage over upright cabinets was their smaller size, making them seem less obtrusive, although requiring more floor space (more so by having players seated at each end). The top of the table was covered with a piece of tempered glass, making it convenient to set drinks on (hence the name), and they were often seen in bars and pubs. Owing to the resemblance of the plastic to hard candy, they are often known as "candy cabinets", by both arcade enthusiasts and by people in the industry. They are also generally easier to clean and move than upright cabinets, but usually just as heavy as most have 29" screens, as opposed to 20"-25". They are positioned so that the player can sit down on a chair or stool and play for extended periods. SNK sold many Neo-Geo MVS cabinets in this configuration, though most arcade games made in Japan that only use a joystick and buttons will come in a sit-down cabinet variety. In Japanese arcades, this type of cabinet is generally more prevalent than the upright kind, and they are usually lined up in uniform-looking rows. A variant of this, often referred to as "versus-style" cabinets are designed to look like two cabinets facing each other, with two monitors and separate controls allowing two players to fight each other without having to share the same monitor and control area. Some newer cabinets can emulate these "versus-style" cabinets through networking. Most commonly used for games involving gambling, long stints of gaming, or vehicles, such as fighting games, flight simulators, and racing games. These cabinets typically have equipment resembling the controls of a vehicle (though some of them are merely large cabinets with fair features such as a great screen or chairs). Driving games may have a bucket seat, foot pedals, a stick shift, and even an ignition, while flight simulators may have a flight yoke or joystick, and motorcycle games handle bars and a seat shaped like a full-size bike. Often, these cabinets are arranged side-by-side, to allow players to compete together. Some of these cabinets are very elaborate, and include hydraulics which move the player according to the action on screen. Sega is among the biggest manufacturers of these kinds of cabinets, while Namco released Ridge Racer Full Scale, in which the player sat in a full size Mazda MX-5 road car. These are close relatives to deluxe cabinets except the player sits inside the game itself. Examples of this can be seen on the Killer List of Videogames for games such as Star Wars, Sinistar or Discs of Tron. The mini or cabaret is a squatter version of the upright cabinet. It may also have a smaller monitor. Mini cabinets spare bulk and are easier for small children to play than some full-size cabinets. Countertop or bartop cabinets are usually only large enough to house their monitors and control panels. They are often used for trivia and gambling-type games, and are usually found installed on bars or tables in pubs and restaurants. These cabinets often have touchscreen controls instead of traditional push-button controls. They are also fairly popular with home use, as they can be placed upon a table or countertop. Usually found in Japan, these machines have multiple screens interconnected to one system, sometimes with one big screen in the middle. These also often feature the dispension of different type of cards, either a smartcard in order to save stats and progress, or trading cards used in the game. Since arcade games are becoming increasingly popular as collectibles, an entire niche industry has sprung up focused on arcade cabinet restoration. There are many websites (both commercial and hobbyist) and newsgroups devoted to arcade cabinet restoration. They are full of tips and advice on restoring games to mint condition. Often game cabinets were used to host a variety of games. Often after the cabinet's initial game was removed and replaced with another, the cabinet's side art was painted over (usually black) so that the cabinet wouldn't misrepresent the game contained within. The side art was also painted over to hide damaged or faded artwork. Of course, hobbyists prefer cabinets with original artwork in the best possible condition. Since machines with good quality art are hard to find, one of the first tasks is stripping any old artwork or paint from the cabinet. This is done with conventional chemical paint strippers or by sanding (preferences vary). Normally artwork cannot be preserved that has been painted over and is removed with any covering paint. New paint can be applied in any manner preferred (roller, brush, spray). Paint used is often just conventional paint with a finish matching the cabinet's original paint. Many games had artwork which was silkscreened directly on the cabinets. Others used large decals for the side art. Some manufacturers produce replication artwork for popular classic games—each varying in quality. This side art can be applied over the new paint after it has dried. These appliques can be very large and must be carefully applied to avoid bubbles or wrinkles from developing. Spraying the surface with a slightly soapy water solution allows the artwork to be quickly repositioned if wrinkles or bubbles develop like in window tinting applications. Acquiring these pieces is harder than installing them. Many hobbyists trade these items via newsgroups or sites such as eBay (the same is true for side art). As with side art, some replication art shops also produce replication artwork for these pieces that is indistinguishable from original. Some even surpass the originals in quality. Once these pieces are acquired, they usually snap right into place. If the controls are worn and need replacing, if the game is popular, they can be easily obtained. Rarer game controls are harder to come by, but some shops stock replacement controls for classic arcade games. Some shops manufacture controls that are more robust than originals and fit a variety of machines. Installing them takes some experimentation for novices, but are usually not too difficult to place. Raster monitors are easier to service than vector monitors. Normally, unless the main tube is blown, a raster monitor will provide good display characteristics with perhaps a few minor color adjustments. Vector monitors, on the other hand, can be challenging or very costly to service, and some can't be repaired at all (they have dwindled in use since the 1980s and parts are hard to come by). Sometimes they will have to be replaced completely, but even finding replacement monitors is difficult since few, if any, are produced any longer. Bare new CRTs are still available from some suppliers (vector monitors use the same basic tube as a raster, just with different electronics), but as they are bare tubes they usually require the yoke to be removed from the old tube and fitted to the new tube and setting up, which isn't usually a job that can be undertaken by the amateur arcade collector. Retrofitting other monitor technologies to emulate vector graphics can also be done. Some electronic components are stressed by the hot, cramped conditions inside a cabinet. Electrolytic capacitors dry out over time, and in many classic arcade cabinets their service life is nearing the end. If a game has its original raster monitor, it will usually need to be "re-capped"—that is, some capacitors will need to be replaced so the monitor will deliver a proper image. Due to the size of the capacitors and the voltages present inside a video monitor, this can be a dangerous activity and should only be attempted by experienced hobbyists or professionals. If a monitor is broken, a replacement can usually be obtained via coin-op distributors or parts suppliers. If a cabinet needs rewiring, some wiring kits are available over the Internet. An experienced hobbyist can usually solve most wiring problems through trial and error. Many cabinets are converted to be used to host a game other than the original. In these cases, if both games conform to the JAMMA standard, the process is simple. Other conversions can be more difficult, but some manufacturers such as Nintendo have produced kits to ease the conversion process (Nintendo manufactured kits to convert a cabinet from Classic wiring to VS. wiring). Some cabinets are constructed entirely by hobbyists to mimic an arcade cabinet using emulators such as MAME and a PC to replace the game hardware. These home built cabinets have many of the features of real arcade cabinets (such as a coin box, marquees etc.). MAME arcade units can combine several arcade controls (such as two types of joysticks and a trackball) in one unit to enable play of many different games. Other projects can involve converting a regular single game arcade cabinet into a MAME cabinet, eliminating the need for building a cabinet. At least one company manufactures flat-pack style cabinet kits made from Medium-density fibreboard. These remove the need for the hobbyist to cut to shape large panels of the material, but still require assembly, painting and finishing; and fitting out with a game-system, controls and display. Bespoke arcade cabinets can also be custom built to order, allowing the hobbyist to design the cabinet removing the manual skills necessary for putting a cabinet together. Other projects have involved building DIY tabletop cabinets and disassembling the casing of Game Boy Advance[clarification needed] handhelds thanks to the abundance of arcade classics compilations such as Namco Museum and other titles. Some pre-manufactured arcade cabinets were even introduced for using the iPad as a monitor. ^ "Arcade Machines of the highest quality - Bespoke Arcades". Bespoke Arcades. Retrieved 12 July 2013. ^ "Choose your arcade machine". GameTime. Retrieved 12 July 2013. ^ Hurley, Oliver (7 February 2008). "Game on again for coin-operated arcade titles". Guardian. Retrieved 12 July 2013. ^ "Multigame Games List". Bespoke Arcades. Retrieved 18 December 2012. ^ "Turnarcades Custom Arcade Machines". Turnarcades. Retrieved 8 July 2010. ^ "Announcing our new Customisable Multi-Arcade". Liberty Games. Retrieved 17 December 2010.